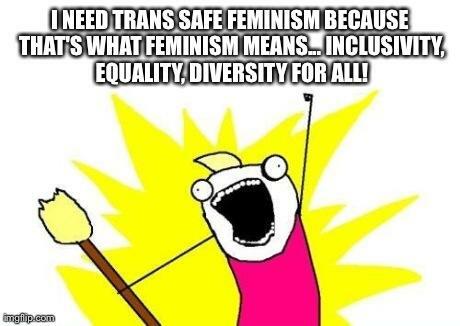 Next Saturday, I am pleased to announce that there will be a meeting on “Trans Safe Feminism” in Nottingham in which we will be exploring how, if not making feminist spaces entirely safe, we can at least make them safer. In lieu of this week’s post, I’d like to invite readers to peruse the materials I’ve put together, with a lot of help and consultation, on the accompanying website, linked to above.. This is a free resource and you are welcome to use it and share it. Any and all feedback is entirely welcome, via comments below or the contact form, and please do contact me if you would like to be involved in the meeting. This entry was posted in Uncategorized and tagged Cisgender Privilege, Feminism, Trans Inclusion, Transgender on September 28, 2014 by Sam Hope. I decided to write an update as my other blog about the conference has started to be shared in the run-up to the event. I sincerely hope it has the desired effect of deterring people from becoming invested in a “fight” against what is happening there. It’s clear to me now from last year’s events that good feminists can be easily duped by insider/outsider dynamics – the people shouting at the door will always be perceived as the real threat, and those “inside” will rally together – even if in peace-time they would not have agreed with each other. The cracks that are beginning to show in the discourse then get papered over. I honestly believe we should stand back and patiently wait for the cracks to reveal themselves. The influence of transcritical feminism over the conference is not sustainable because the ideas do not hold water, they are currently propped up by the sense of a perceived “outsider threat” that motivates people to pull together and not engage their critical thinking skills. It could encourage those connected to or attending the conference to listen less to the outsider voices of trans people, who are being painted as the wolves at the door (rather than the beggars at the door we actually are). Those involved might instinctively rally around somebody who is perceived as sufficiently powerful to repel the “invaders”. We make different choices of leader in war time than in peace time, so fabricating a war provides opportunities for a certain type of leader. I have not personally seen or heard of any rumours or lies about the conference, although certainly people are talking about it, and its loose connections with Femifest’s particular brand of trans-antagonistic radical feminism. It would be so easy for mischief-makers to fabricate a story in order to further the perception of a “trans threat”. I think I would have seen and quashed any rumour that the conference is trans exclusionary, had there been one going around. Although I’m sure whoever posted the comments above on the NWC page was sincere in believing them, there’s a possibility they have been manipulated. And whatever the truth about someone somewhere having either a) “lied” or b) more likely, made an honest mistake about the conference’s policy, I have a problem with how it’s reported. Using the NWC facebook page to stir up a sense of threat from the trans community, would seem to me a small abuse of power by those within the institution towards those outside of it. It is a particularly sensitive issue because of how quick and willing to think badly of trans people many non-trans people still are. There is a positive eagerness in some circles to hear the latest scare story and I have seen wholly apocryphal tales about trans people spread like wildfire many times during my years involved with women only spaces. If you go onto the NWC facebook page, there are other hints that the politics of the conference are trans-ignorant if not transcritical. I picked up on their use of Sheila Jefferey’s favourite term “transgenderism” (My response – the word “deliberately insinuates that being transgender is a political movement, ideology or practice rather than something you fundamentally are”). I also had a discussion with them about “women’s health” as a subject for the conference’s women only space. Many of us know that transcritical activists use the idea of “women’s health” to try and and show that trans women are not “real women”. Of course in doing this they also marginalise trans men and genderqueer folks who sometimes have the same gynaecological needs as cis women but don’t identify as women. I still cannot work out whether I was hearing a genuine intention to do better in the response to my query, or merely being pacified, but I will for now assume the former and let everyone know there is hope, even if we have a long way to go. I will keep people posted if anyone from the conference gets back to me or makes an effort to be positively involved with the “trans safe feminism” project and upcoming meeting. What I would like to hear from the conference is “we got a lot of things wrong this year, and acknowledge our need to learn from the trans community”. We have a long way to go before trans people in all our diversity will be comfortable to attend the appropriate feminist spaces, and meanwhile the trans community will continue to be the beggars at the door, and continue to be painted as a “menace” to give those inside an excuse not to consider us. Update – I have not edited the above since being banned from the NWC page for trying to challenge what I see as further provocation on the page. In my comment I requested that the NWC committee commit to further training around trans issues. I am left wondering why there were so few transgender voices on the page, other than the voices of that rare breed of trans person who aligns with transcritical feminism. I long for a day when we can engage in a balanced, empowered discussion where we are all insiders and nobody is left shouting (or in my case, weeping) at the door. This entry was posted in Uncategorized and tagged Feminism, Nottingham Women's Conference, Trans Inclusion, Trans Marginalisation, Transgender on September 19, 2014 by Sam Hope.